Picture was made short before this sign was removed? Not sure about in this location but when I lived in the UK, the round signs meant mandatory issues. This might be construed as a mandatory route for cyclists but the line through it would mean the end of the mandatory route. Could it be something like that? My new guess is that they want you to stay on the bicycle trail. Ah, much clearer now. See, the trail once ended right about where the sign is located. A new extension has been introduced (s-curve to the left) but the sign remained. The sign was to discourage riders from continuing past the end of the trail into the small park just beyond. 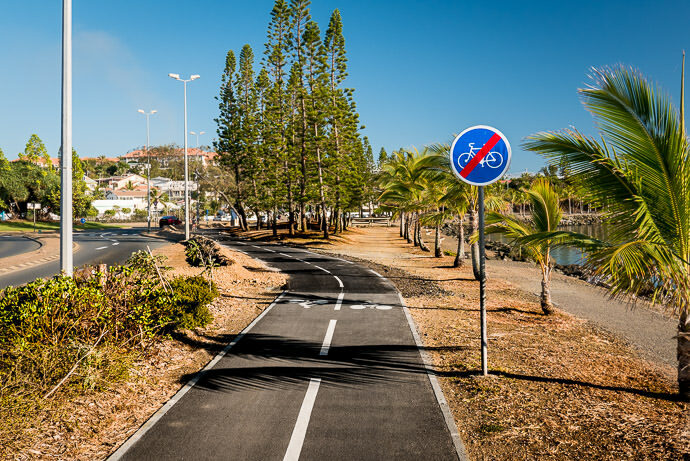 “End of bicycle road ahead”? Maybe it is too obvious, but perhaps it means ‘no riding bicycles on the grass’, meaning only ride your bicycle on the paved bicycle track. I can’t imagine any other reason for the sign, as you can see the image of a bicycle on the paved section in the background of the image. The emblems on the ground look more like motorcycles, so I’m guessing it is a “no bicycles allowed” sign.